Getting around can throw up some tricky issues for hard-up students but they can also benefit from targeted services and discounts. Here are some tips to make student travel easier. National Rail offers anyone aged 16-25 and in full time education 1/3 off rail fares. A railcard to get the discount costs £30 for a year, but, considering the substantial price of many train tickets, the cost can often be made up in savings from just one journey. It’s also a good idea to check deals with student bank accounts, such as Santander’s 123 account, which currently offers the railcard free of charge for four years. Megabus can also make it much cheaper to travel across the country. While coach journeys take a while, huge savings can be made if you’re not in a hurry, especially when tickets are booked well in advance. Journeys also come with free Wi-Fi, charging points and a 20kg luggage allowance. Money can also be saved by splitting long train journeys into shorter sections, and paying for the tickets separately. Websites like www.splitticketing.com and www.splitmyfare.co.uk will do all the legwork in calculating your cheapest option for you. This simple method can bring about huge savings – the best that’s been discovered was a journey from Manchester to Kettering, which, when paid for as two separate tickets, reduced the fare to less than half price. It’s also useful to get on the mailing lists of transport companies to hear about new deals and discounts, or ones that only run for a limited time. Virgin Trains East Coast, for example, currently offer 40% off all tickets with Unidays, so being informed about these deals can mean big savings, although it probably means putting up with a few unnecessary emails. Finally, savings can be made simply by booking in advance –12 weeks before travelling is often recommended as ideal - so it’s worth buying tickets as soon as you know your term dates, or the weekends you’ll be going home. It may be useful to find out whether there are any transport deals already set up by your university. In Durham for example, for just £1 a day, you can get unlimited bus travel within the city zone, and all you have to do is show the driver your campus card. Or if you study in London, you can save by investing in a Student Oyster card, which means you can get 30% off the price of adult travel cards, as well as bus and tram season tickets. To be eligible, you just have to be over 18, and enrolled in a participating school, college, or university. For shorter journeys, not to mention some exercise, many universities have made it very easy to get around by bike. Some have bikes you can rent - at Bournemouth, you can subscribe to bike access for just £40 for the year. 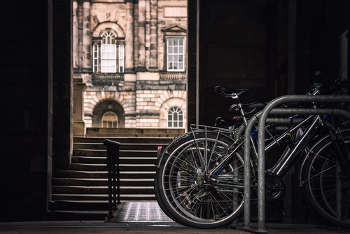 Students in bigger university cities can also make use of public cycle hire schemes, such as Santander Cycles in London, which hires out bikes for as little as £2. If you find yourself stranded and out of cash, most universities run schemes with local taxi companies so you can get home and pay later. It’s a much, much better option than walking home on your own. Often, if you give them your university ID card, you can return the next day with your hangover and pay the fee then. Some cities will also run public transport at night, such as the night tubes and buses in London. Services are often reduced at night, so it’s worth checking before starting on the jägerbombs.